Modes are more than just a pattern of notes for your solos (like any other scale). They also have harmonic systems that give us a certain musical feel or flavour. Theory is great, but we need to hear these nuances if we're really going to take full command of what we play. After all, there aren't always written cues for keys and chords. Our ears need to be a reliable judge. 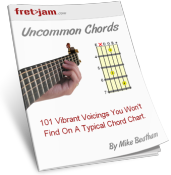 Understanding this system of modal harmony (including chord progressions) will help you to identify when a mode is being used in music - and it happens a lot! For example, Dorian has a particular sound, as does Mixolydian and the other modes. Your aim is to recognise these sounds when they occur in music and therefore know when and how to play along - essentially where to put your fingers. In music, parallel means "on the same root note". For example, A major and A minor are parallel keys. When we play two or more modes starting on the same root, we can really hear the different musical colour they offer. Note: We'll look more at changing between modes (sometimes called modal interchange) in a coming lesson, as this is a more advanced concept. This "parallel" concept is the basis upon which the process outlined in this lesson is formed. Once you establish a fixed root note, your ear connects with a "centre of musical gravity". We can call this the key centre. From that centre, we can really hear the different colours each mode offers our music. The ear is then trained to pick out the often subtle differences between the modes, which translates into other keys. As well as melody, each mode has its own harmonic system. For example, each mode has its own sequence of chords, based on its intervals, that can be used to form chord progressions (parts of songs, essentially) and flows of harmony that invoke that mode's flavour. It's quite difficult to explain, which is why ear training is the best way to get that "eureka" moment! The primary major mode around which most major key music is written (whether intentionally or not). Raise the 4th of Ionian to get the mysterious sounding major mode of Lydian. Let the sound of that #4 (sharp 4th degree) soak into your brain! Raise the 6th of Aeolian for the more "open" minor sound of Dorian. Can you describe the feeling when you touch on that 6th? Using the above method, I've created some five minute modal tracks (all in the key of A) you can use to practice over (try both melody and harmonising using shapes from the above patterns), or just listen to help internalise each mode's unique sound and feel. Much of the time, we won't have visual cues for keys or chords. By training your ear to recognise common movements, you'll know which "system" the music you're listening to is formed around and be able to jump right in and play along or develop it. You'll be surprised at just how much music uses these six modes (three major, three minor). That's not to say you should intentionally write your songs in a particular mode - that would be unnecessarily constraining. But it's clear that composers and songwriters gravitate towards these modes, even if they don't understand where these movements come from! So it's hugely valuable to be able to recognise the "Dorian sound", the "Mixolydian sound" etc. as and when it arises, whether you're looking to add a solo or an accompanying harmony part.